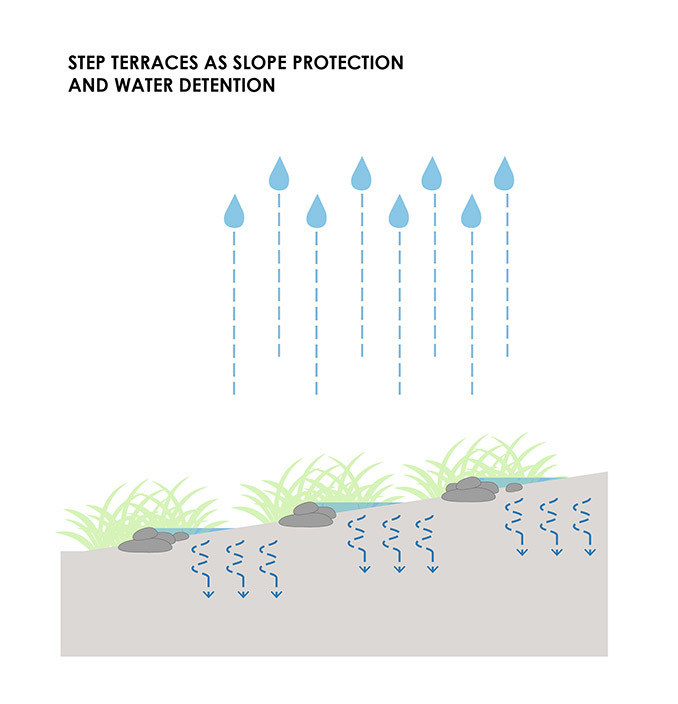 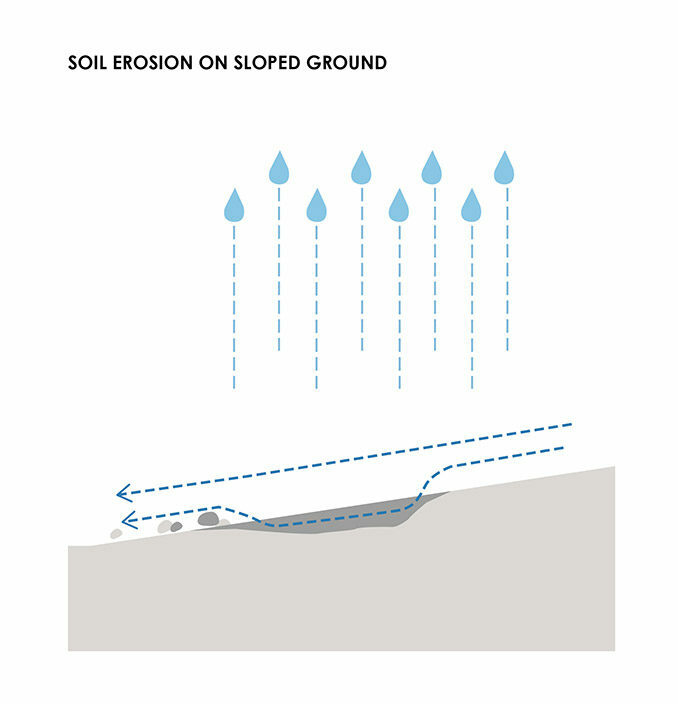 Based on an understanding of both local farmer’s wisdom and natural forest ecological formation in the valley, a sustainable landscape concept is proposed by 2 landscape strategies; Stepping Terrain and Rain Corridor, are employed throughout 5 landscape areas. 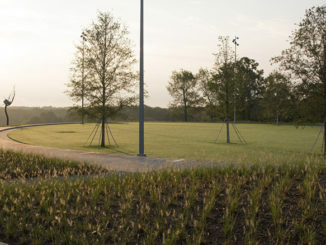 Along the site boundary, dense layers of trees vary in size and species are created to compose a forest-like backdrop for the campus. 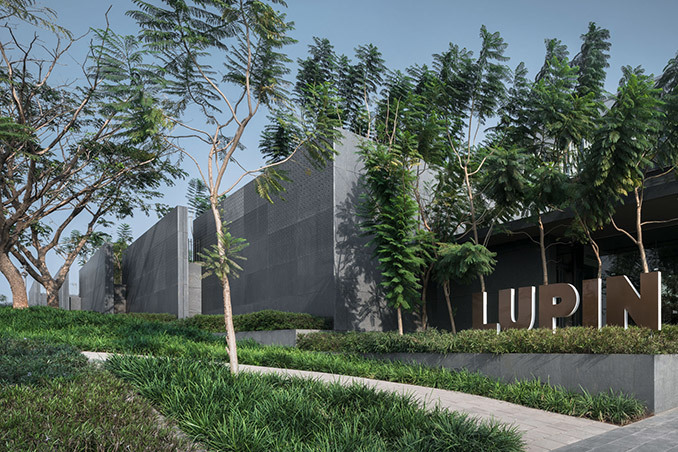 A path meandering through the forest allows a quiet strolling amidst a natural setting. 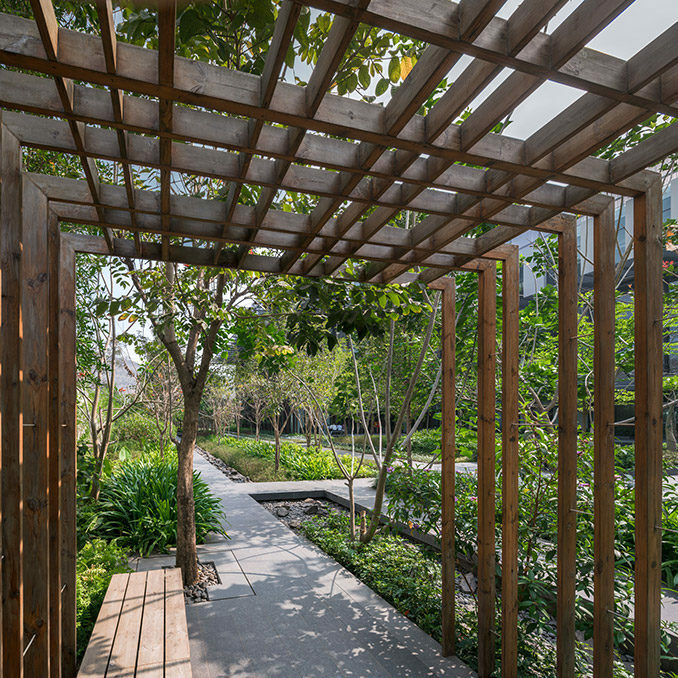 Series of timber cabanas along the path provide private gathering space among colleagues. 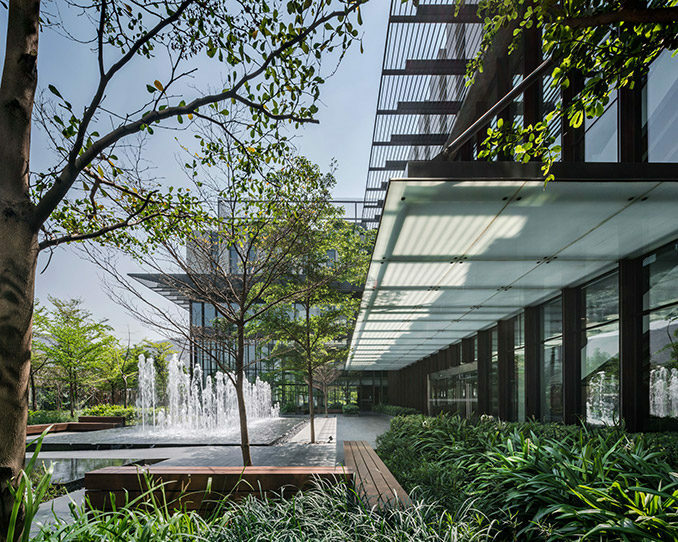 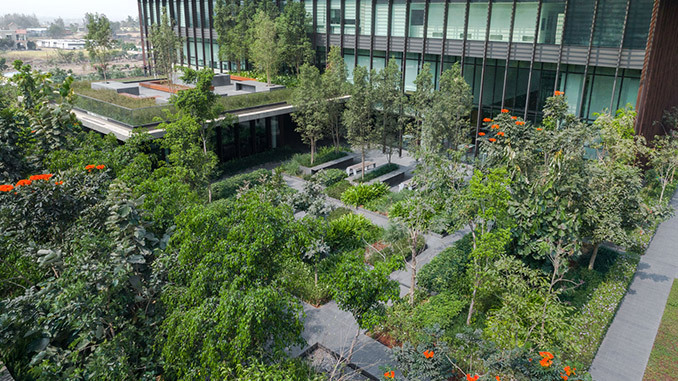 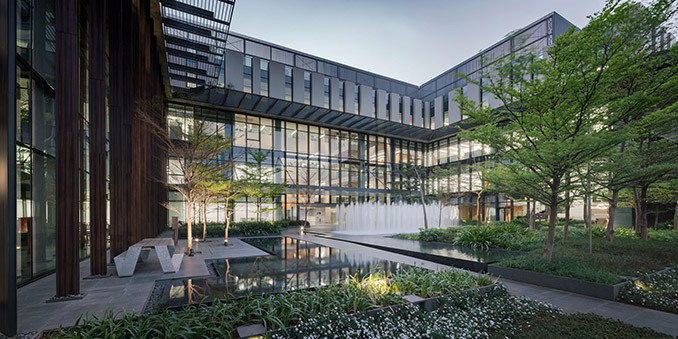 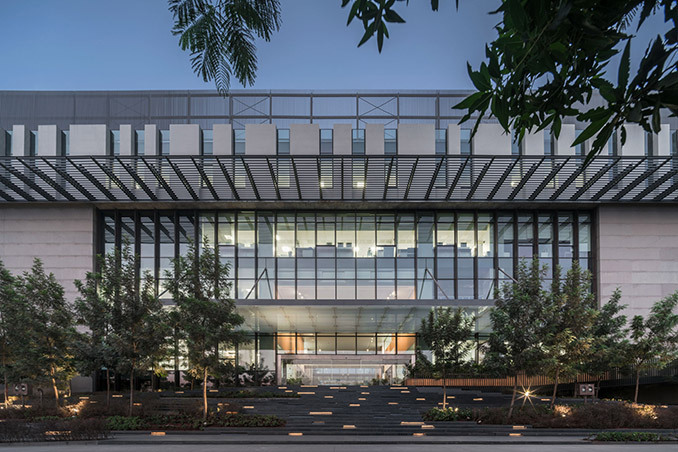 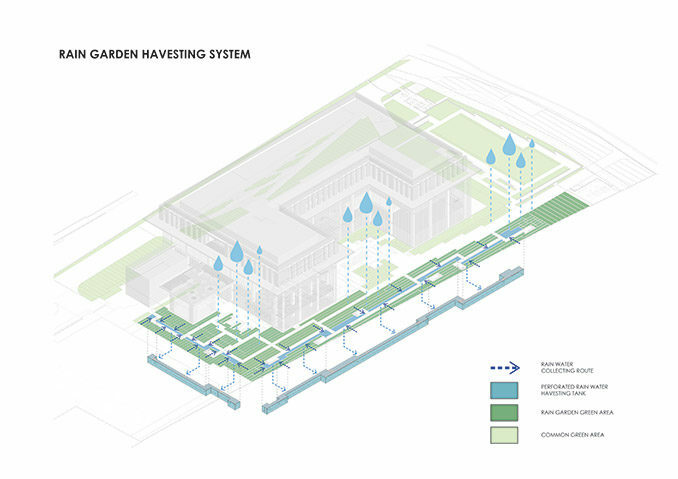 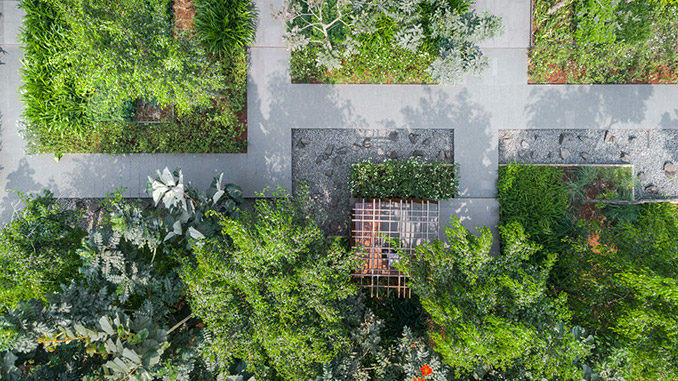 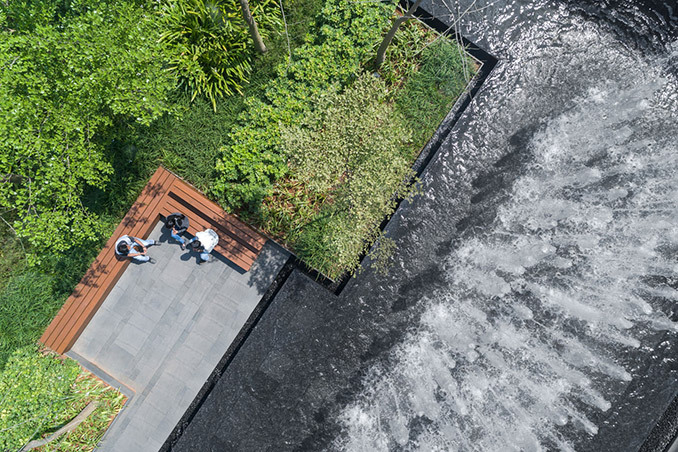 In order to sustain the dense greenery with less watering, the entire area is made lower to receive the run-off rainwater from the entire site including the roof drain from the building. 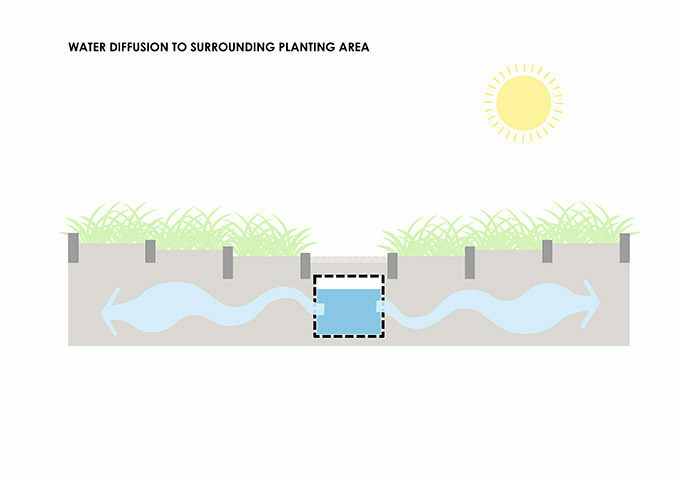 PVC-based perforated tanks are constructed along the path to collect the water during monsoon season, and slowly release the excess water to adjacent dried-up soil underground through osmosis reaction during the dry season. This becomes a rain garden that naturally dampens all year round. 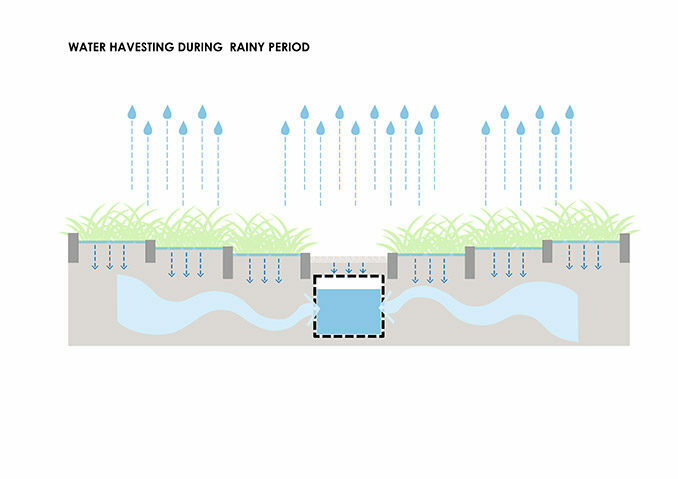 This flood mitigation system should be unusually high precipitation happened. 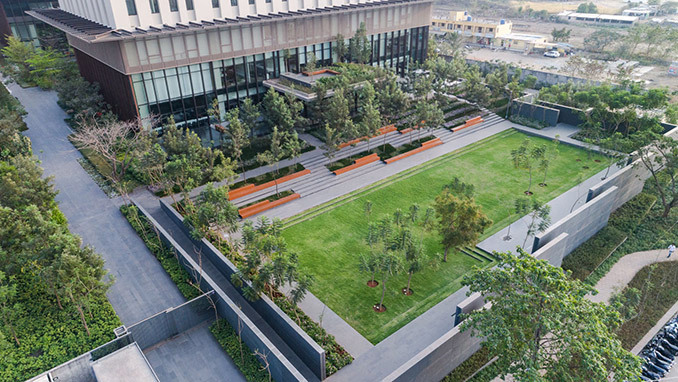 A big open space of green lawn is created in front of the building where a grand meeting room is located which is a provision for mass gathering and major events of Lupin. 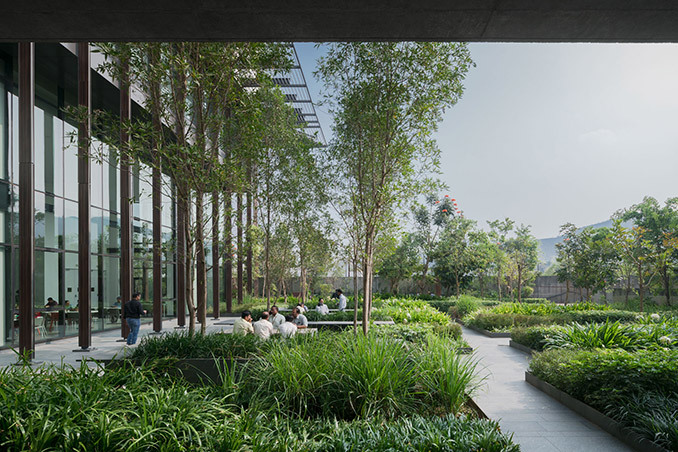 Traditional space between the grand meeting room and the lawn including a reflective pond, flowering meadow, and amphitheater terrace, which together form a nice cooling space that sometimes will be used for a training session. The lawn is terminated with a series of staggered retaining walls that also function as front feature walls when being seen from the public roadway next to the lawn, and space between buildings. 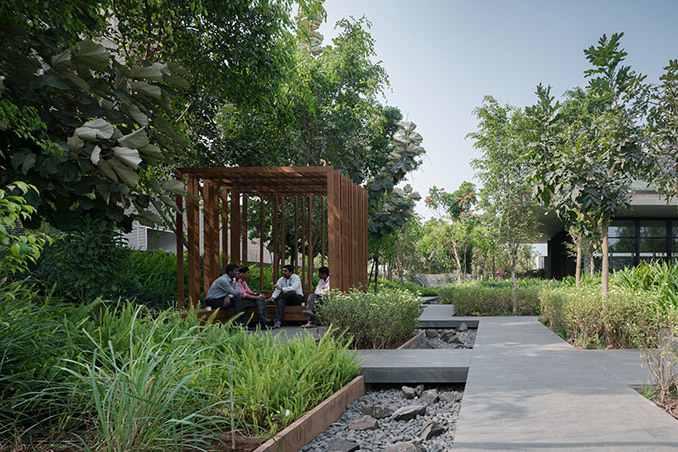 Adjacent to the canteen spaces at the back of the building, the landscape is crafted to reflect the agricultural pattern in this area planted with several edible shrubs. 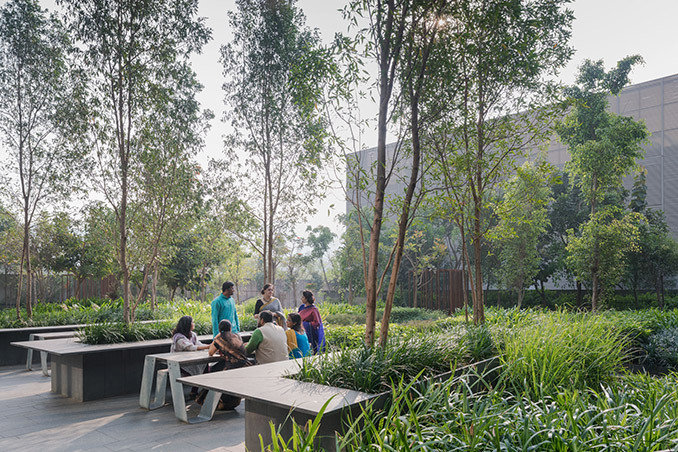 Long lunch table topped with trees invites people to gather and share quality times amidst lush surrounding. Surrounded by building on 3 sides, the courtyard is well protected from the harsh sunlight and wind making it an ideal sitting area all day long. Pockets of sitting area are distributed amongst a group of trees surrounded by large expanses of a reflective pond. 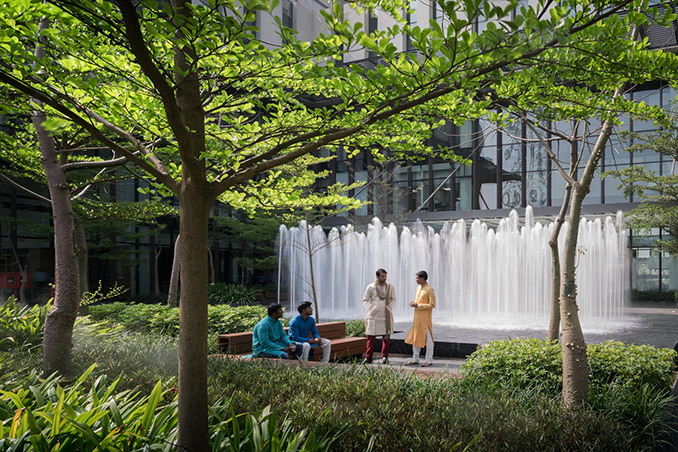 Interactive fountains are operated during the day to further enhance the microclimate. 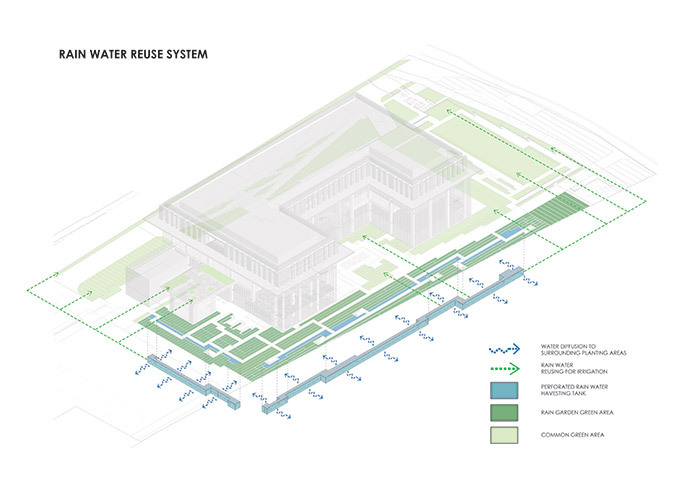 To negotiate drastic level changes from road level to 1st-floor building entrance, grand steps were introduced. 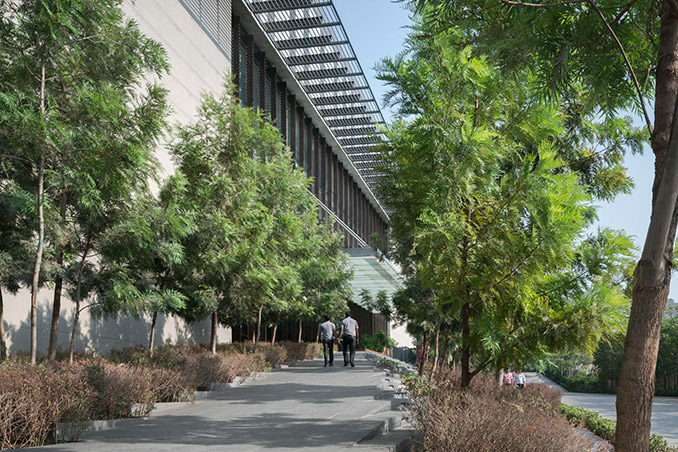 The main pathway from the pedestrian entrance starts from one side of the grand step, slowly ramped up cutting across the step to form a mountain shape. 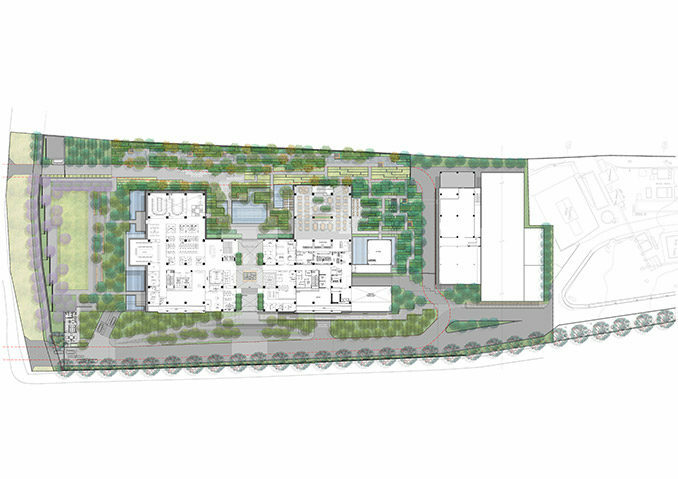 The ramp is also doubled up as handicap access. 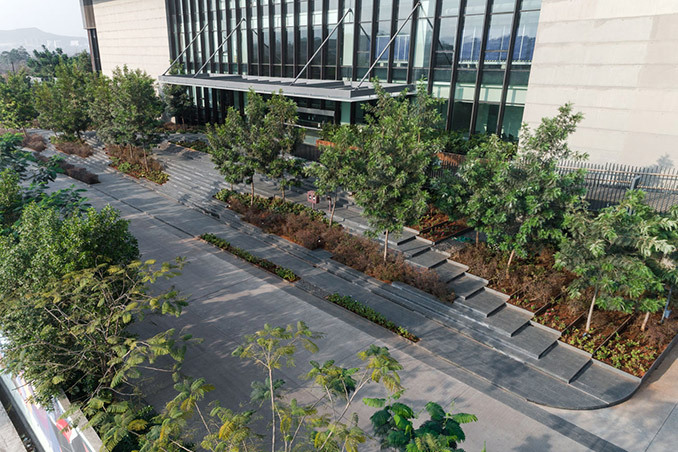 Local tree groves and contrasting shrubs grow through part of the steps to soften the hardscape elements. 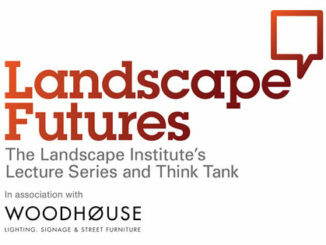 EVENT | Landscape Futures Debate: How can we build beautiful places?